The Best Commercial and Residential Roofing Company in Arizona! Jim and Ron Brown on the top of the Bank One Ball Park in 1997 (currently Chase Field). 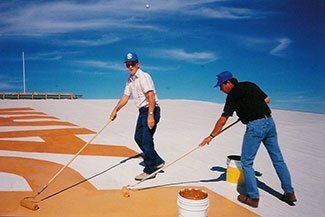 JBS Roofing started in Ron Brown’s garage in 1982, with just $3,000, a lot of hard work and many long days. Over 30 years later, we have grown the company to close to 70 employees. A company’s longevity cannot exist without a strong foundation of passion, integrity, experience and first class customer service. Ron Brown is still the owner of JBS Roofing and oversees the daily operation of the company. His brother, Scott Brown, is the Vice President of the Commercial Division, while his daughter Valorie Brown-Miller runs the Residential Division. 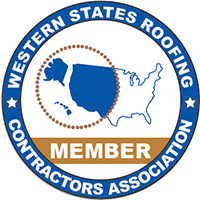 Our management staff has over 200 years of combined roofing knowledge! We understand the investment our customers are making in their properties and strive to install the best roofing systems in the state. Receiving a workmanship warranty from a company that has been around for over 30 years is the greatest reassurance to a customer. It gives them peace of mind that we will still be here down the road to honor our commitment to them. Unlike most other roofing companies, a workmanship warranty from JBS Roofing is 100% transferable with no fee if the property transfers ownership. This is an added value to your home and one of the many things that set us apart from our competitors.